I love bacon. Not in that incredibly obsessive way the rest of the world seems to be, but I really appreciate bits of bacon sprinkled on food to enhance it. Bacon Lover's Day is August 20 and this recipe may be just what you need. I've taken my favorite bacon recipe to a new level and have enhanced it to create a sweet and savory, cheesy, buttery quesadilla. I have made bacon jam for quesadillas before, on the blog. It's such a flavorful addition, I can't help but put it on another kind of quesadilla. This time: it's an upgrade. Breeze, Honeycrisp or Red Delicious apples are best for this recipe. You want a firm, crisp apple with just a little bit of sweetness that will hold up to the intense flavor of the bacon jam and the creaminess of the cheese of your choice. Personally, I don't care for the texture of Red Delicious, but those New Zealand Breeze apples are perfect. As for cheese, I used Cabot's sharp white cheddar and on occasion I've used Kerrygold's Dubliner. Both cheese are very intense and a very little goes a long way. Brie or mozzerella are great substitutes that melt well and match with the buttery, crispy lavash. I like using lavash flatbread instead of the usual tortilla for this quesadilla because it holds up better to the weight of heavy ingredients and squares are easier to cut into smaller pieces. 3. 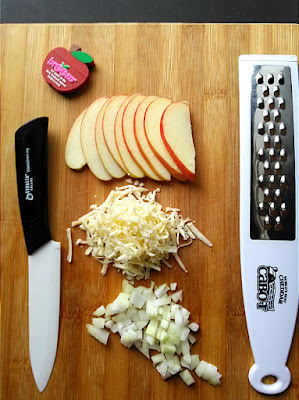 Sprinkle and layer 1 cup of shredded cheese on top of the apple slices. 4. Fold the lavash over to make a sandwich. 5. Heat a nonstick skillet over medium-high heat and melt 1 Tablespoon butter and 1 Tablespoon olive oil. 6. Cook the quesadilla on each side for 2 to 3 minutes until golden brown. Repeat with the remaining ingredients and fillings. Slice into wedges and serve with beer (because beer goes great with everything). YUM! Bacon jam is on my list to make. I love the idea of pairing with with apple and cheddar. I have been wanting to make Bacon Jam since the FWC! Thanks for motivating me! Need to make bacon jam ASAP, then these quesadillas!! What a great use of bacon jam!